The first 110 or so Olson 30 boats were supplied with Sparcraft single spreader masts. The Sparcraft extrusion is a teardrop shape, coming to a fairly defined point at the luff groove. Afterwards Pacific Boats decided to use Ballenger Spars as their rig supplier. The first handful of spars that Ballenger built for Pacific Boats used Sparcaft extrusions (Ballenger purchased extrusions from Sparcraft and supplied finished masts to Pacific Boats). From roughly #110 onwards (after Ballenger had built their own extrusion die) the Olson 30 rig used the Ballenger B5740 extrusion which has a flat luff groove section on the aft side. Sometime in the middle of production of the Olson 30, the extrusion was changed again, when Ballenger made a new extruding die. 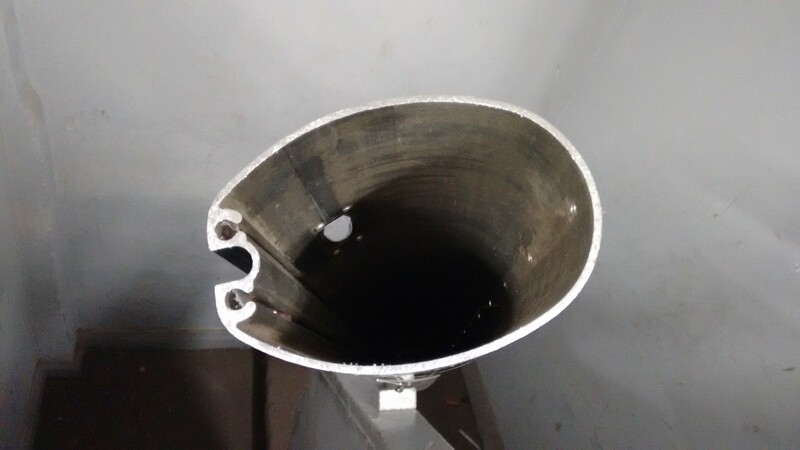 These ‘Version 2’ extrusion masts can be identified by the lack of the small tracks beside the luff groove. The small tracks were originally used to secure the internal PVC wiring conduit. All replacement pasts from Ballenger are made with the ‘Version 2’ B5740 extrusion shown in the diagram below. This is the Sparcraft mast extrusion that was used on boats up to approximately hull #110, easily recognizable from the teardrop shape. This is the early version of Ballenger B5740. The extrusion originally had tracks either side of the luff groove which were used to secure the PVC wiring tube. 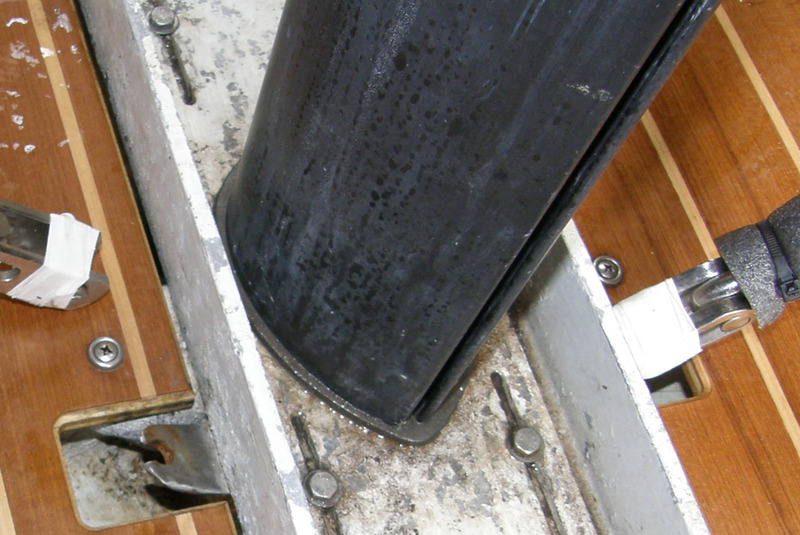 Note that this photo is taken of the section of mast where the sail is loaded into the groove, so the groove has been opened up locally. Most of the mast has a much narrower groove. 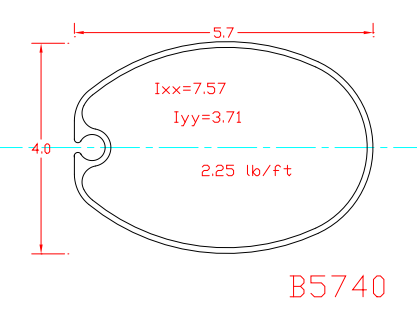 The second version of Ballenger B5740 does not have the tracks beside the luff groove. If you order a new mast from Ballenger this is the extrusion that will be used. The Olson 30 rig with single spreaders, rod inners and outers and wire intermediates started getting installed on Olson 30’s around Hull #100. It was also a retrofit configuration, whereby early rigs had the intermediates added after the boats were delivered. Because the rig had its cap shrouds approximately 28″ from the masthead, in heavy air it was felt the rig was difficult to control. Buzz Ballenger was never concerned about breakage of the mast, only that in heavy air the mast could have a tendency to s-bend athwartships due to the cap shrouds being so far from the masthead. The intermediates were an answer to this that could be retrofit to an existing mast and helped keep the mast in column in heavy air. Using the same extrusion but adding the intermediates allowed all Class boats to be as close to identical as possible. All Olson 30 owners could get a free retrofit kit for the intermediates from Pacific Boats if they wanted one. Once this rig modification was implemented all masts supplied by Ballenger were intermediate-equipped. Ballenger later designed a dual spreader rig for the Olson 30 using the same extrusion. Ballenger also created a modified single spreader rig for some Olson 30 owners in the PNW. The PNW single spreader rig had single spreaders which are longer than the standard single spreader rig, and the cap shrouds were move almost to the top of the mast. Only a few of these PNW single spreader rigs were built by Ballenger, but some boats did this modification themselves. All rigs now supplied by Ballenger have double spreaders. Single or double spreader rig? I asked the same question awhile back, and it seams no one really knew. I have a single spreader rig that I have mixed feelings about. In any conditions other than the top end of the #1 with a bunch of big boys, I prefer the single spreader. However, in that 12-18 knots, with the big sail, the mast is quite scary. I don’t believe it’s safe, at least not safe with the narrow (33″) spreader length. I understand the Jack Easterday [Jack’s Back] in the Bay Area has had great success with a single rig, but I have not personally talked with him. Not long ago I was just going to convert to the double package, but our upwind speed has been so good, I’m considering not doing anything now. Anyway, my rig tension is 22 on the LOOS Rod Tension Gauge, that’s about 1080# of standing tension. All the other boats in the yard are double spreader rigs (10?) and range for 16 to 18.5 (800#-975#). I’ve played with the lowers to just keep the mast in column, I haven’t measured them. We also learned that the wire Loos gauge reads about 39 on our boat, and 37-38 on the others, it definitely not as sensitive as the rod gauge. Barnstormer does have rod rigging jock straps and a custom “Beam-Of-Destiny” from Rocket Science Engineering (BOD, or strut as you call it) between the chain plates. These seem to make a big difference in maintaining rig tension. None of the boats in the Shilshole Dry Yard carry as much rig tension as Barnstormer. At first I really felt the need to convert to the double spreader rig, now I’m not as hot on the idea. Recently, we have played with the rake and lowered the lowers standing tension and the mast has looked better. Barnstormer currently seems pretty fast upwind in most conditions, [how true! — JR] although our brand new Ullman sail probably help too. I talked with Buzz Ballenger about putting the shrouds at the top of the mast, and maintaining the single spreader configuration, but he advised against it. He reasoned that the shroud angle would be too narrow and the rigging would fail. He commented that he has looked at over 100 combinations to make this rig design right and wasn’t happy with any of them. He said no one wants to lengthen the spreaders, which is the only way to maintain the shroud angle and move the uppers to the top of the rig. I haven’t actually talked with Jack E., but I’m assuming if he extended his uppers to the top of the mast then he has also lengthened he’s spreaders. After some hard thinking, my current ideas lean towards this setup: moving the uppers up and lengthening the spreaders from 33″ to 36″ apiece. We seldom seem to be effectively sheeting tighter than 3″ from our single spreader anyway. I understand that the double spreader boats are poking the upper spreader into their genoa pretty hard, but never through the lower spreaders, our single spreader is located in the fattest part of the sheeting angle world. I did not think the move to double spreaders had anything to do with keeping the rig up at all. As I recall, the complaint was that forestay tension was difficult to control because of masthead tip sag. The problem was exacerbated by the fact that the cap shrouds came into the mast 40 inches below the forestay. Because of the overkill size of the spar cross section, the problem wasn’t expected by the designers of the rig. I had heard that somebody put a strain gauge to the forestay and proved that there was a lot of dynamic unloading going on with the forestay, which is what finally drove me over the edge. The fix was to raise the cap shroud attachment point. In order to do that, without resorting to extremely narrow shroud attachment angles, the options were to switch to doubles or lengthen the spreaders. Most of us switched to doubles. As it turns out, lengthening the spreaders, was probably the correct answer (cheaper and easier and less windage and less weight aloft), but, at the time, we were trying to maintain our narrow sheeting potential, so we went with doubles. Debatably, a mistake. SG’s rig is original, but if replacement was ever required, I would advise Tom to go with the long single spreaders…. do the math. People who changed to doubles expecting that they were reducing rig loads did not do the math. Because the attachment angle is not extremely different single and double spreader rigs, there is no reason to expect that the shroud tension would be extremely different either. (Unless you simply moved the cap shroud attachment point to the masthead without lengthening the spreaders). Forestay control, and maybe a little bit of mast column control are the primary benefits.